Time flies like an arrow a Korean proverb says. This issue features our director of the ASEAN region (GM Eng-Sin Tan), our director of Ireland (Master Des Galligan) and announcing our HUGE event in Seoul in November of this year! Check your mailbox for your copy. If your membership isn't active contact us. We are getting better and better! Our federation is ending 2016 on a strong note. A delegation from our international headquarters in Seoul attended seminars in Denmark from November 4th to November 6th. 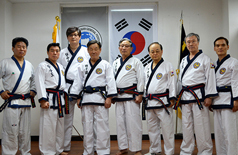 The group consisted of our president, Grandmaster Choung, Koe-Woong, Grandmaster Ku, Hong-Kyu, Executive Director Kwon, Dae-Seong and our Assistant General Secretary Tan, Eng-Sin(from Malaysia). The event was thanks to the ceaseless efforts of our Denmark Representative, Master Erik Kristensen. 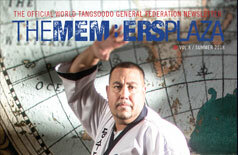 We are proud to announce the release the 4th issue of our newsletter with Grandmaster Pedro Vangas as the cover story. The fifth issue is in development. 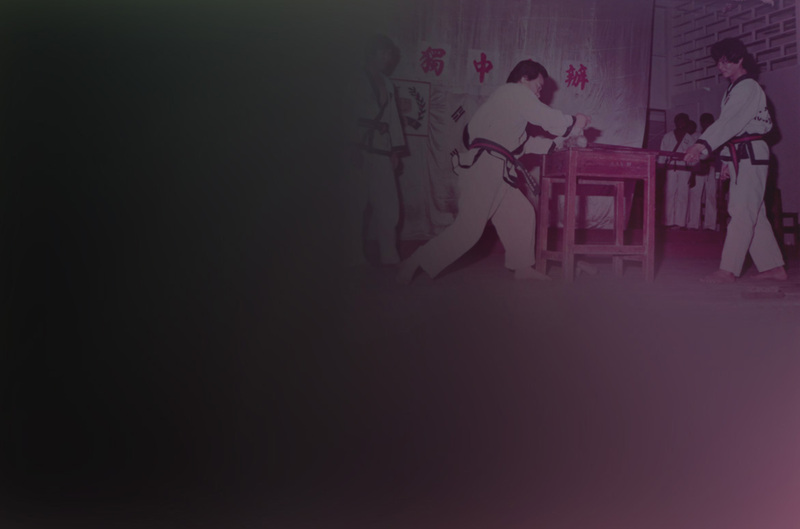 Tang Soo! We have celebrated moving new office and R&D facility , also having new business plan and special trainning session for black belts. 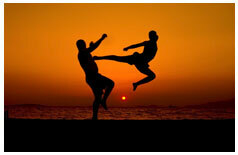 Martial arts is supposed to be as mental and spiritual as it is physical. Throughout history the greatest warriors were scholars and vice versa. We of the World Tang Soo Do General Federation are taking that tradition seriously. 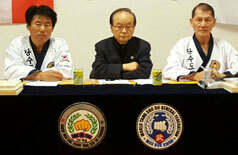 We have established a relationship with the Institute Of Martial Arts and Sciences in England. 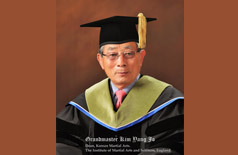 Our director, Grandmaster Kim Yang-Jo cemented the agreement by accepting the appointment of Dean of the Faculty of Korean Martial Arts and Senior Fellow of the institute. 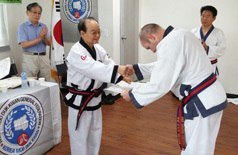 On Saturday, July 12th Master Erik Kristensen from Denmark took part in a promotion test for 6th Dan. His wife and daughter also took part. 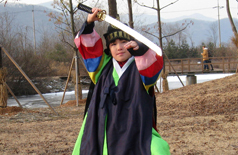 He performed admirably and showed great martial spirit. Well done Master Erik! These certificates will be awarded upon completion of a seminar (levels: Basic/Intermediate/Advanced/Elite) at one of our academy locations in Korea or upon documented proof of aptitude in the appropriate skill area and at a certain level of competency. If earned during a seminar they are discounted and added to the seminar fee, but if applied for outside of the traditional training the fees will be $50 - $100- $150 - $200 respectively. The members who complete “Elite“ levels in a skill area will be mentioned on our federation website and mentioned briefly in our newsletter. Finally after months and months of careful planning and deliberation the World Tang Soo Do General Federation has a voice. 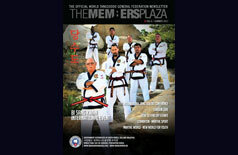 This being The Members Plaza, a newsletter dedicated explicitly for our members. It will feature columns, editorials, international events, movie reviews, interviews and much more! This will be for the members because it will be by the members. This means we not only need your support, we need your participation. Please contact us by e-mail for more information. 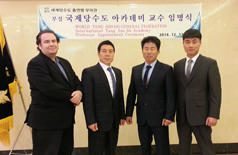 On the 13th of December, 2014, the World Tang Soo Do General Federation International Academy appointed professors in numerous areas of study for the purpose of preparing the future by scouting young masters with special techniques and theories. 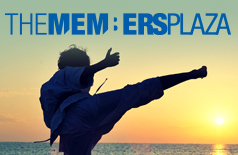 It is to follow the 70 year traditionof Tang Soo Do and to level up the state of Tang Soo Do suzerain by research and developement of traditional and creative techniques, and to offer curriculums which answers the expectations of Tang Soo Do instructors throughout the world. 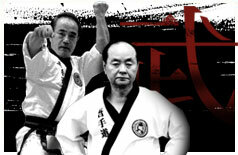 Congratulations on 10th Dan Appointment! 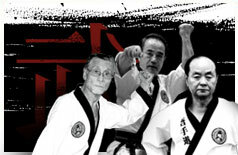 In fact, no one has the authority to appoint someone 10th dan in Tang Soo Do. 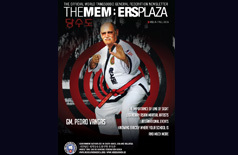 The 10th dan is awarded to the seniors who did meritorious deeds for Tang Soo Do or contributed to the art for over 60 years by their juniors’ or fellows’ recommendations. 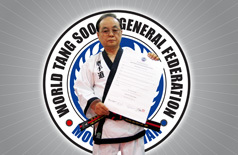 As the certificate says, the General Secretary of the World Tang Soo Do General Federation, Choung Koe-Woong is qualified to be awarded 10th Dan. Hereby, we are letting the world know that it is a big honour and an auspicious occasion.